Painted wooden plate by M. Gibson featuring the "Norway Building", modeled after a twelfth century Norwegian Church (stavkirke). Norway's entry at the 1893 Chicago Worlds Fair. The closing of Little Norway represents a loss to Mount Horeb area tourism and tradition, but parts of the 85-year attraction will live on in the Historical Society’s collections. The Winner family, fourth-generation owners of the site, have generously donated artifacts and also gave the Historical Society time to acquire funds to purchase others. An anonymous donor gave the Society nearly $35,000 to purchase artifacts, some of which would be familiar to Little Norway visitors. This spring, approximately 300 objects were carefully selected by a Historical Society volunteer, representing significant regional connections, family history and relaying the story of the popular tourist attraction. From there, a search for individuals or foundations to aid in the purchase began. The Winners donated approximately 80 of the pieces to the Society, while also setting aside items for museums in Stoughton and West Bend. In the summer, an anonymous donor came through to help the Society acquire many of the items, the donation coming through a trust established by the late Raymond and Margaret Vicker. Raymond Vicker was a journalist and author, and former London bureau chief of the Wall Street Journal. Other members of the family of Isak Dahle, the founder of Little Norway, also came through with donations. Alex and Karen Hobson offered to acquire for the Historical Society the iconic bedroom set that graced the first building that visitors entered upon visiting Little Norway. Little Norway opened in 1927 as first as a summer retreat for the Dahle family, then as a living museum celebrating Norwegian culture. It hasn’t been open for visitors since 2012. Regional folk art attributed to Oljanna Cunneen of Blue Mounds; Pat Edmundson and Lynn Martinson of Mount Horeb; Per Lynse of Stoughton; and Olaf Colburson and Ed Barsness of Vermont Township. Dahle family possessions, including a bedroom suite, oil portraits, a kubbestol – or chair – carved from a trunk and the ring that Onun wore during the Civil War. An 1930s donation that included an 1835 chest, 1829 ale bowl, 1791 bentwood box and 1830 wooden milk bucket. An elaborately decorated chest dated 1855 decorated with “Madison ‘Visconsin’” on its back side. 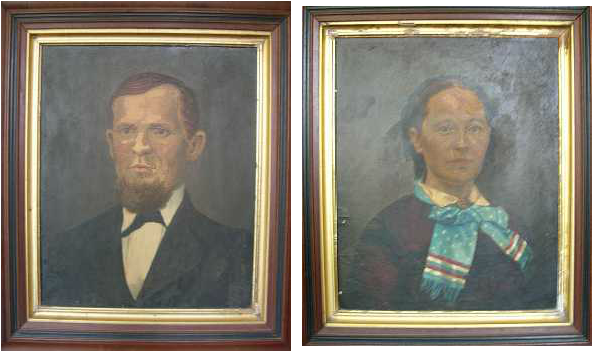 Onan B. and Berget Dahle, whose grandson Isak founded Little Norway. Slide show of some of the Little Norway Artifacts. Mouse over to see caption and the navigation icons at the top. For additional information, view Facebook Architectural Group and story by Channel 3 in Madison.